With all of the exciting things happening here we’ve barely had a chance to breathe. So, it’s been a few weeks, but we we’re immensely proud to announce we’ve been named one of the Albany Area’s “Best Places to Work” by the Albany Business Review for the second year in a row. The companies on this list are chosen based on the feedback offered through employee questionnaires. So for us it’s always an honor to be listed here, because the one thing Jim cares more about than his clients is his staff. Last year, we posted some of the employee reviews that helped us win this award (And we we’ll do it again this year once they come in). But this year we also wanted to do something a little different too. Even though IMN may be a great place to work, sometimes our Ninjas have to leave us. Sometimes the other things in our lives outside of our careers, love, family and difficult decisions lead us away from home. Today, we’re saying good-bye to Ashley Downey, one of our veterans. Ashley is a member of our Customer Service team and I’ve had a chance to work closely with her. She is an unbelievably talented woman, one of the hardest workers I’ve ever met and one of my closest friends here. Before she departs, she wrote this letter that we wanted share with you, for a personal, inside look, at what it really means to work here. As I sit here trying to come up with a cohesive, well thought-out story about my four years at Internet Marketing Ninjas there are memories that are numerous and irreplaceable. How do you compose a shortened version of the past four years of a working life into a couple of pages of words? The personal growth, career advancements, and friendships made along the way are subjects that are difficult to put into words. As you read through, I do apologize for any redundancy or melodramatic silliness, but well, this is my story at Internet Marketing Ninjas and I don’t think I would have done it much differently. Back in 2008, I was somewhat of a recent college graduate, working part-time waitressing jobs, while living with my ever-growing disgruntled father, due to lack of work and was starting to cause a ticking time bomb. I knew action had to be taken. Eventually, I began my life at IMN, which at the time was We Build Pages. I specifically remember my first week at We Build Pages. I would come in every morning promptly at 8am, wearing my freshly ironed khakis, button-up shirt, pearl earrings, and my work bag, which looked like a women’s briefcase. I undoubtedly am still made fun of for my “work bag”. At the time, I thought this job was going to be a typical cubical desk-job, clock in and clock out for your half hour lunch, clock out at the end of the day and that would be the extent of it. I was completely unaware that this “desk-job” was going to be an integral force in my life for my personal growth and development. As the week progressed, I soon realized that the work environment was beyond your typical 9-5, clock-in and clock-out job. The people I was working with were eager to teach, but most importantly, wanted me to succeed. I soon started forming friendships that have turned into some of the closest people that I truly care about, not just as work friends, but some of my best friends. We Build Pages at the time was a small group that continued to grow with continued success year after year while providing me the opportunity to grow with the company as well. Now, I know you’re thinking, gee, this sounds too good to be true, Ashley. I’m not going to say there weren’t growing pains along the way with challenges and hardships, but in my opinion you learn more from those hardships and difficulties. You can choose to learn and grow from those hardships or focus on them and circle in a vicious cycle of going nowhere. We Build Pages and its employees learned, transformed and had an amazing ability to adapt which has only made me learn to do the same not only in the working world, but in my life as well. After two years with We Build Pages I choose to take a daring leap and move out of state. Not only was everyone very encouraging, but they supported my decision and kept close contact. During this “daring leap” I went through very personal hardships that I had never experienced before. After a very emotionally heart-breaking 10 months I decided I needed to come “home” which included coming back to We Build Pages. Quite honestly, those friends I made in those two years prior to moving were some of the most important people in my life that got me through the hardest loss in my life. They made me get up every day, made me want to get back to “normal” (as I write this Adele came on Pandora – talk about sob-fest). When I walked back into the office for the first time after I originally left I felt like I was back home, back with my family. As you may be starting to piece together, I never saw We Build Pages as a “job” after my first week back in 2008, it became a part of my life. Yes, I agree there should be a separation between work and your life, but work started to matriculate into my everyday life. My best friends and I worked together, one of my managers was more like a father figure to me and I couldn’t be more ecstatic to come back to my family! I have been back with We Build Pages, or what we are now known as, Internet Marketing Ninjas, for a total of approximately four years. My life has recently taken a new direction which causes me to have to leave IMN. I can say with a sad heart that I’m not just leaving the job, but I’m leaving my family that has been through the highs and lows in my life, molded me into a stronger employee and person, honed in on my skills and only made me sharper and stronger and more confident every day. How do you leave a place where you have all of your best friends in one place? How do you walk away from a Ninja dojo (that one is for you Jim) of people that you know love you and want, not only the best for you career wise, but encourage you to do what’s best for you selflessly. I don’t know about you, but I don’t know many people that can say these things about their job. Internet Marketing Ninjas is a special place that I don’t think I’ll experience ever again. Treasure your time at IMN. If you don’t know many of the people you work with here, you should probably take the time to do so, I don’t think you’ll be disappointed. We love you too Ash…you’ll be missed more than you know. “@IMNinjaJess: . 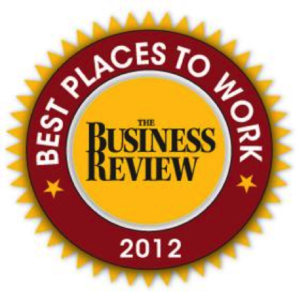 @NinjasMarketing Still a “Best Place to Work” in 2012 – http://t.co/YsPMwVLe” — Good Luck @ashleyalways! “@NinjasMarketing: POST: Internet Marketing Ninjas Still a “Best Place to Work” in 2012 http://t.co/LQuirjQQ” Love this! Great article, it has been a pleasure reading it. I know exactly how that feels when it gets difficult to separate work and personal life.